to get quite a rarity - just our second Marsh Wren ever banded at MBO. Notes: Throughout this spring numbers have been above average, and true to form we ended our eighth annual Spring Migration Monitoring Program on a strong note. The 67 birds we banded was a record high for week 10 (improving on our previous peak of 59 all the way back in our first year, 2005), and pushed us to a season total of 993 birds banded, a nearly 10% increase over the previous record of 906 we set just last spring. Diversity was also well above average, with 66 species banded (tying the record from 2009), and the 143 species observed during the course of the season was above average. The nearly 300 repeats this spring is also a new record, while the 103 returns are only a few behind the record of 113 in 2010. Also of note is that we added another two species to the MBO site checklist this spring, both of them coming in the final two weeks of the season. Last week, we were lucky to spot a Black-bellied Plover flying overhead. This week, the June 3 census yielded our first Tufted Titmouse - arguably our most "overdue" species, given that some have been seen semi-regularly just a few kilometres away in Baie d'Urfé for several years now. Not surprisingly, aside from the Tufted Titmouse, there were few other additions to our list for the season this week. In fact, Swainson's Thrush was the only other newcomer - both banded and observed. We received another interesting recovery from the Bird Banding Office this week. The only Merlin we've ever banded at MBO, back in May 2007, was reported from Winchendon, Massachusetts, roughly 340 km southeast of us. It was flagged with an unfamiliar code, which upon research translated into "found dead; band on skeleton only". How long the bird might have taken to decompose is difficult to know, but given that five years have elapsed since we banded it, it seems highly likely that it survived at least a few more years. Of course it would be interesting to know at what time of year it died and whether it was migrating through northwest Massachusetts or wintering/breeding there ... but there are some answers that simple band recoveries can't give us. All the same, we are very glad to have received this news, and thank all those who make the effort to report band sightings. As always for the final week of spring, the top ten species banded are based on just three days. Considering that, Cedar Waxwing had a particularly strong showing, with nearly as many individuals banded as in the previous full week. 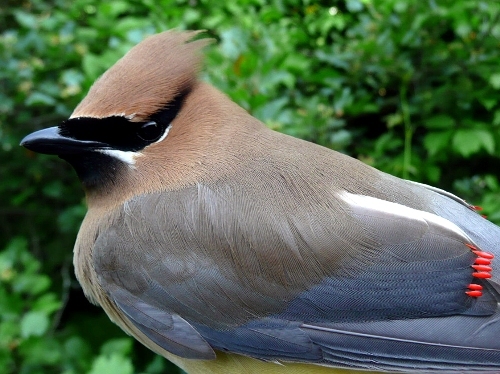 That pushed the season total of Cedar Waxwing to 77, narrowly eclipsing the previous spring record of 72 from two years ago. The rest of the species were present in much lower numbers. Blackpoll Warbler is one of the traditional late spring migrants, and made the top two for the fifth time in the past six years. Following close behind were the other two late spring regulars, Traill's Flycatcher and Wilson's Warbler. Somewhat surprisingly, we also banded four more Red-winged Blackbirds - by this time they have been on site for a while, but it seems that a few managed to elude us this long at least. Rounding out the list, we had four species tied at 2, and another tied with one individual each. Migrants falling off the list from last week were Northern Waterthrush, American Redstart, and Magnolia Warbler. Full results for the season will be published in our annual report at the end of the year. For now, a sneak preview of the banding totals for spring. The top ten species, in order, were Red-winged Blackbird, Tennessee Warbler, Cedar Waxwing, White-throated Sparrow, Ruby-crowned Kinglet, American Goldfinch, Yellow-rumped Warbler, Magnolia Warbler, Yellow Warbler, and Northern Waterthrush. 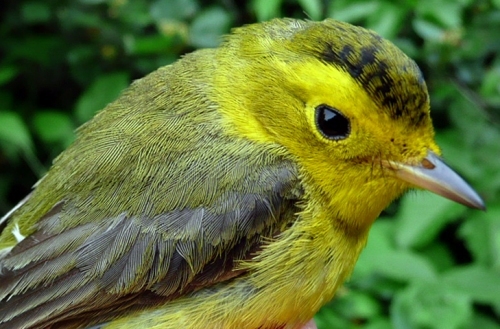 Despite the overall record number of birds banded this spring, only two species in the top ten (Tennessee Warbler and Cedar Waxwing) and six others (House Wren, Hermit Thrush, Gray Catbird, Nashville Warbler, American Redstart, and Purple Finch) were at record highs individually; rather it seems that most species were banded in above average numbers. This is reflected in just two species being unusually uncommon. For the second year in a row, we banded just one Rose-breasted Grosbeak, a notable departure from our previous spring average of 7. The other significant low was Slate-colored Junco, with also just one banded, compared to a long-term average of nearly 17. However, this is likely a function of the early spring triggering them to move north earlier than usual, largely missing our banding season. The top three species observed in week 10 maintained their rank from last week, and the mean daily count of Red-winged Blackbirds in fact remained unchanged too. Yellow Warbler and American Goldfinch dropped down the list a bit, and Tree Swallow moved up a few spots. 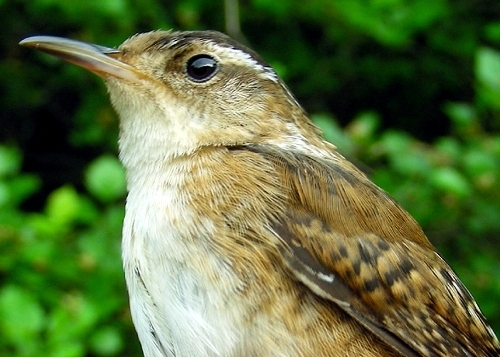 The four new additions this week are all summer residents - Song Sparrow, Canada Goose, Black-capped Chickadee, and House Wren. Of course, most of those have been around in good numbers throughout spring, but their relative abundance is more prominent once migrants have passed through. That being said, two of the species they displaced from last week's top ten (Baltimore Oriole and Common Grackle) are also local breeders, while Ring-billed Gull is also in the area throughout the summer; only Tennessee Warbler has moved on for the next while, to return as molt migrants beginning already in late July. Astute readers will note an odd pattern in the list, with five species having a mean daily count of 8 individuals, yet being ranked as fourth, fifth (two species), and seventh (two species). This is not an error, just a product of our rounding/ranking approach - we round the mean to the nearest whole number for ease of comparison, but still rank them based on actual means. In this case, we on average observed 8.0 Tree Swallows per day, 7.7 Yellow Warblers and Song Sparrows, and 7.6 Canada Geese and Black-capped Chickadees. And so another successful spring migration monitoring program has come to an end - our eighth in a row! As always, we could not have done it without the dedication of our banders, extractors, censusers, scribes, and other volunteers. Sincere thanks to all who contributed over the past ten weeks, and we look forward to all of you joining us again for our fall migration monitoring program, beginning as always on August 1. Cedar Waxwings were by far the most dominant bird in the nets in our final week. 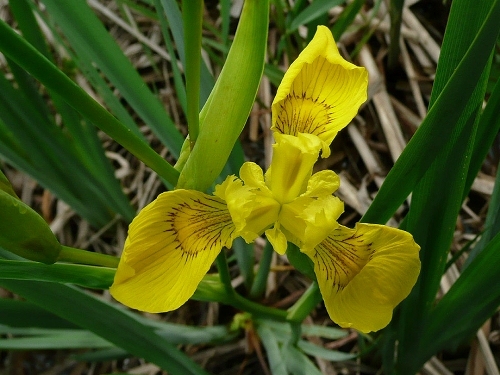 Aside from the birds, MBO is also alive with flowers in spring - the Yellow Flag Iris along the borders of Stoneycroft Pond is always one of the highlights.